We have incorporated our latest State of the Art design, which takes advantage of sophisticated computer technology along with our exclusive remote sensing feedback circuitry to bring you a potent and powerful tool against periodontal disease. At the touch of the switch, you alternate from scaling to polishing plus a variety of other operations. The SON-MATE II is auto tuned, by constantly scanning and compensating; the oscillation is maintained at optimum frequency when pressure is applied to the tip, eliminating even partial loss of power. You can perform curettage, deep scaling of heavy calculus and stain removal. Conclude the prophylaxis treatment by polishing teeth. 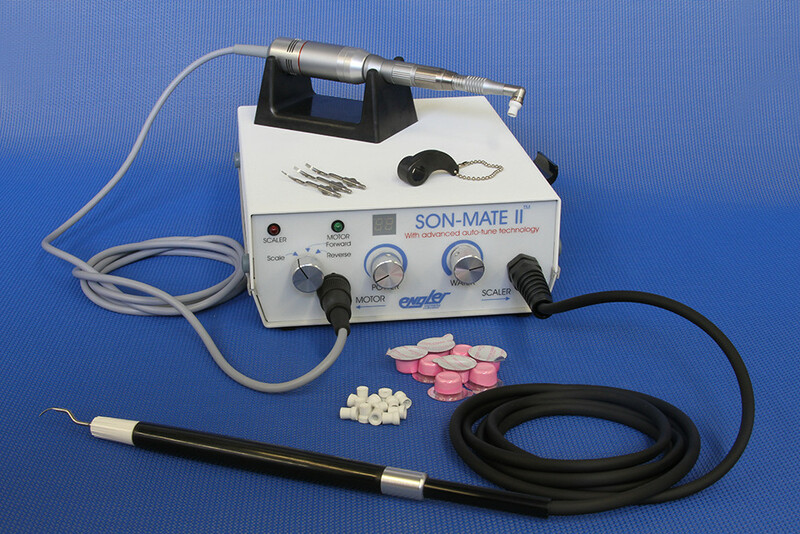 There are 9 different tips available for the SON-MATE II. Our heat-treated surgical stainless steel tips glide smoothly across the tooth surface while the water flows through the tip DIRECTLY to the operative site, gently cooling and lubricating the tooth and washing away the dislodged debris. At the touch of the foot control, the chevron shaped TRANSDUCER (stack) instantly surges power to the tip. Even after the foot control is released, the scaler’s delayed cavitation feature disperses any excess water into a fine mist thereby eliminating the annoying “after drip”. 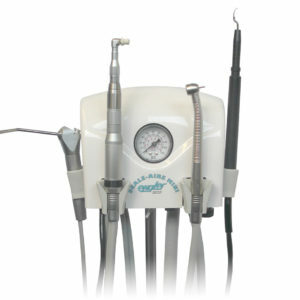 The stack remains in the handpiece, the tips are interchangeable. This arrangement is much more economical as you do NOT have to purchase the entire tip / insert combination. 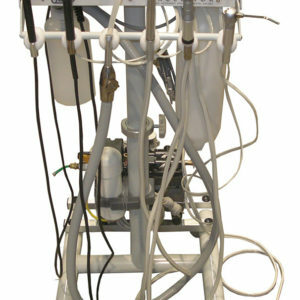 Recommended sterilization is steam autoclave or chemiclave. The high speed and torque of the micromotor is used for cutting, drilling, sectioning, and many other procedures. 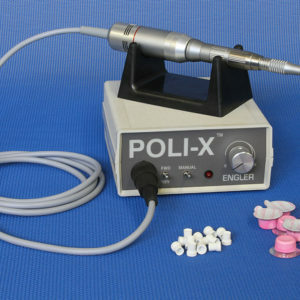 Lower speed is used for polishing to complete the dental prophylaxis. Diamond and Carbide bur kits 1.6-mm. dia., Diamond cutting disc with 2.35-mm. dia. mandrel. Shipping Weight: 11 Lbs. / 4.93 Kg.